All Unquiet Things will be released from Random House on January 11th, 2010. Great review! I really wanna read this book but haven't gotten a copy yet. Hopefully soon! Reading it right now and can't wait to find out what happens! Thanks for the review! I've been looking forward to reading this book for sooooooo long. I know you've been raving (positively) about this book. I have to admit that I wasn't tempted, but I might be now. Great review! I just added this to my wishlist. It looks really good! This cover though unsettling has me entranced. I feel like I have to read this book just to get a handle on the cover. Great review! I'm so excited to read this book. Thanks for your review, I really feel the excitement in reading this. this is madness of the highest order, cant this be use to give electricity for Nigerians . if there is power supply the people will celebrate the 50 years with joy and gratitude. All people at shool are trying to get the high grade and they buy the pre written essay related to this good topic at the writing services, and sometimes they require the outcomes about essays for sale. These kind of stories are well written and I would like to read much from here. I found a lot of informative stuff in your article. Thanks! What a great find this website is! I have been reading through posts now for well over an hour! found this website really informative and helpful! "All Unquiet Things" is well written & bit heavier than most of the YA I have read, but I finished the book in 3 days. It kept me interested & was a fast read. 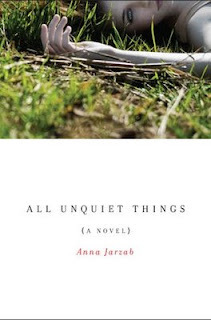 The murder mystery keeps the plot going, but "All Unquiet Things" is much more-- a story of grief, acceptance, & self-discovery. All the Unquiet Things was a refreshing book for me, just what I was looking for. After discovering I was burnt out on supernatural stories this heartbreaking mystery set in the here and now, without any characters with powers was just what I was looking for. Little, Brown Spring 2010 Sneak Peek! Hunger Games Book Three News!